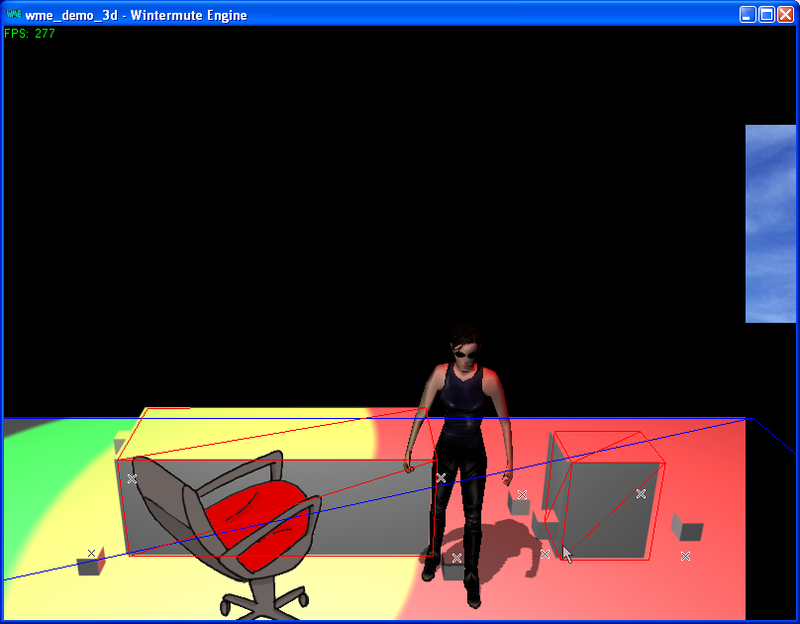 as some of you know, I've been working hard to re-enable the 3D characters support in WME. Now I need your help to test this functionality on as many hardware configurations as possible. If you'd like to help, please download a simple demo and answer a few questions, especially the bold ones (post here in this thread). 1) does the demo run at all? 2) do you see a shadow at character's feet? 3) is the character affected by colored lights? 4) does the demo exhibit any unexpected graphical glitches? 5) what videocard do you use with how much videomemory? 6) what's the approximate FPS (a the upper left corner)? Please note that the demo is very raw You can move the character with mouse and with keyboard. Great news... i will try it asap! I'll try to find some other old graphic cards of mine, a geforce 2mx 400 and some older ati cards, to test the demo. I think its awesome - keep up the good work! Yes and no. The game itself looks fine, but due to the oversize of the background image other applications (in this case Opera) get stretched over to my second monitor. But this happens only during runtime, when I close the game everything wents back to normal, so I think it can be ignored. As mentioned before - great, great, great! The light effects rock!! Unfortunately no shadow at all. Trinity wears to much clothes, but... no. Depends on. In the "normal" default mode I reach up to 290 fps in windowed mode (on a 32 bit desktop), while with the best "let-her-a**-look-like-sugar" quality settings of my card (stuff like 6X Anti-Aliasing, highest mipmap'ing, etc.) which I love to use as often as possible, it still rocks with 160 FPS. Thanks, oh creator of the Matrix. It's been long since I posted here but be assured that I never left, I've just been (and still am) extremely busy working on the story of my game. Who would have thought it'd be so difficult to create a good story for a game... Nevertheless, I kept lurking here all this time on a daily basis (honestly!). Great news about the 3D characters, I know you've been very busy lately with other stuff as well, among others the Dead City translation and the constant help you give here on the forums. Just wanted to say thank you for the hard work, it's much appreciated. Yes, Trinity is getting a reddish and greenish tint when in the red and green areas respectively. - Here too the chair is getting darker when trinity reaches the left and right edges but I think it's part of the scene itself and not a glitch. - When moving Trinity to the area of the window, it would seem she stands diagonally, as if the floor of the room is spherical. Around 30 FPS when Trinity is on screen and around 60 FPS when not on screen (after taking her to the rightmost edge). 2. Won't Molly get jealous of Trinity? Please let me know if there are any further tests you'd like me to do on my pitiful machine, I'd be happy to help if needed. The chair going dark if you go to the top left of the walkable region as gfx johnny reported. And well, maybe it's not the right time for questioning, but... are you planning to implement cell-shaded (toon) rendering? 3) Yep, the character is affected by the different colored lights. 6) Aprox. 86 FPS in full screen mode with a 32 bits colour depth. Thanks a lot for your testing, guys! Could any of you Radeon owners please check if you see an artifact at the "window" similar to the following picture when you scroll to the right part of the scene? I suppose you have VSync enabled right? Ok, I'm afraid I'll have to bother you some more. Could you please download and test a modified wme.exe? (just overwrite the old one). It should display a large shadow at the right side of the scene. Also, it generates a file on your disk, which should contain a picture of the shadow. 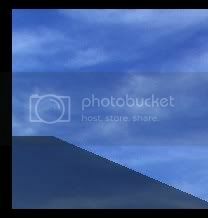 The file is at c:\!shadow.bmp. Please see if this image contains anything or if it's empty. Note: this demo runs considerably slower because it keeps generating the image on disk; that's intentional. i have the same behavior and graphiccard as MMR in the first demo. the second demo: The shadow is on the generated bitmap, but no shadow in the scene-demo.